GEELONG has booked its place in the Victorian Football League (VFL) Women’s decider, after knocking Collingwood out in straight sets with an impressive 14-point win. We took a look at some of the top players from both sides on the day. Did some nice things throughout the game, playing as the loose player in defence. Often she came across to help teammate, Jazz Ferguson who the Cats tried to isolate one-on-one inside 50. She also had a big moment punching a ball across the ground later in the game when Richelle Cranston had a shot on goal. Was really good intercepting, but did miss a few kicks going forward. Had a forgettable moment in the third term dropping a mark in the back pocket, but worked hard to mop up. Got amongst it throughout the four quarters and never stopped trying. Too tall for her opponents in the ruck and often punched it clear of the contest to keep the ball moving on the outside. Not overly mobile at ground level given her height, but laid tackles and put defensive pressure on opponents. One of, if not Collingwood’s best on the day. She worked hard at both ends, dropping back into the defensive 50 to take some good marks, laid great tackles on the wing, and kicked a consolation goal running hard to the goal square and quickly getting boot-to-ball. Her tackling pressure and intensity on the ball carrier was definitely the highlight. Stood tall against the flow and was one of the key reasons Collingwood was still in the contest early. She was composed in defence and able to use the ball well under pressure. Edwards had plenty of defensive efforts and then kicked a goal in the final term, four and a half minutes in to cut the deficit to 20 and give them a glimmer of hope. Another player who kept trying throughout and had a few good moments, spreading to the wings and taking some good marks. She kicked Collingwood’s first major after making a half-lead inside 50, taking the grab and nailing the all-important set shot. Superb in defence, along with Lambert was one of Collingwood’s best. She continually got to the right position one-on-one and ensured her opponents could not get a clean run at the ball. The opposition tried to isolate her one-on-one inside 50 against stronger bodies, but Ferguson held her own. She also ran off her opponent on a number of occasions trying to create drive off half-back. Took a strong mark on the wing late in the game, using her body well to outmark an opponent. Provided an aerial target when she flew for her marks, and did cause some headaches for the opposition when up forward. Won a free kick for being held in the last quarter, but her shot from 35m out just drifted in the breeze and narrowly missed. Did not win a heap of it, but had some classy moments. One example was a clean pick-up off the deck and quick handball to a teammate who kicked long inside 50 late in the game. Played in defence and laid a number of strong tackles. She provided a good run-down tackle on Jaimee Lambert in the third term, forcing Lambert’s kick to sail out on the full instead of hitting a target inside 50. Set the tone early with a big tackle at half-forward to lock the ball up. Had a shot on goal after receiving a 50m penalty but just missed to the left. Her best work was done in close. One of the most impressive players, she was so strong in the air, taking a ton of marks inside 50 and giving her team scoring opportunities. She could not quite capitalise on the set shots, but one-on-one she was fantastic and she positions herself so well. Another player who impressed me with some good hands in the air to take a few important grabs. She also did the defensive things right with her highlight coming in the third term. With the time ticking down she laid a huge tackle on Hannah McLaren to win a free kick just inside 50 and then launched from long range to hand the Cats a 21-point lead. Had a couple of eye-catching moments when she tried to burst away and break the lines, did not always come off but was still noticeable. she had a shot on goal in the third term which just missed. The youngster stood up in the finals intensity and put her body on the line when she needed to. Her stoppage work is superb and she is not afraid to fend-off an opponent and give herself an extra few seconds to clear the ball out of congestion. Very impressive in both attack and defence and one of the main reasons why Geelong strangled Collingwood in the first three quarters. Ran hard to receive the handball in the opening term and then kicked the first goal of the game. Dropped back into defence in the second quarter to mark well, then had an attempt from long range in the third term that just missed. In the fourth term she went back into defence and took a courageous mark at half-back between two opponents. Thought she had a quiet game to start, but then turned it on in the third term when she seemed to be everywhere. Geelong needed a statement to stop the Pies coming, and Cranston did just that. Her combination of power, acceleration and penetrating kick really turned the game in the third term, fending off a number of players and just bombing long to give her teammates the best chance of scoring. Defenders do not often get much love, but Goring was absolutely spectacular. 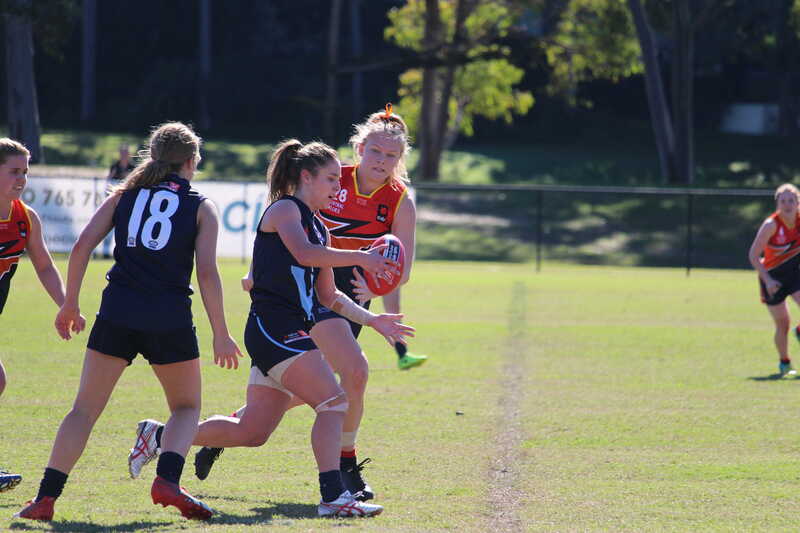 Along with Maddy McMahon and a number of others who refused to let their opponents beat them, Goring just worked incredibly hard over four quarters to stand in front of her opponents and rebound well, taking a number of intercept marks. Goring also pushed up to the wing when required to chop off any quick kicks going forward for the Magpies. HAWTHORN has won its way through to the Grand Final after defeating minor premiers, Collingwood. AFL Draft Central‘s Carly McClen was there to witness the action. The notes for the NT Thunder vs Geelong game will be online tomorrow. 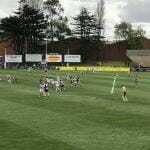 Collingwood AFLW star Chloe Molloy was in impressive form, in the second quarter after being on the ground a minute and a half she kicked the first goal for the Pies to level the scores. She kicked another in the last, a 40 metre goal on the run that bounced through. It was a rare individual effort and she laid eight strong tackles. Played a steady defensive role, crucial to keeping the margin within two goals. She read the ball better than her opponent and was often prepared to play on and kick long out of defence to clear her team from danger. She was crucial in holding up the momentum of the Hawks. Her speed and slick ball movement was a sharp contrast to the Collingwood outfit on the day. She had 17 kicks, her work rate was high for four quarters. Had 12 disposals and laid seven tackles. She was gutsy and attacked hard but found it difficult to break the lines of the Hawks defence. Continued her strong form with three goals and 18 possessions. Excellent captain’s game. Her influence set the tone for the Hawks and backed it up for four quarters. She outmuscled her in-form opponent Eliza Hynes, generating more positive outcomes from stoppages. Was a dominant force in the backline. She smashed packs for the contested ball and took three good marks. She broke through traffic to boot the first major and set the tone for the Hawks. She racked up 11 kicks, nine handballs and four tackles and consistently troubled Collingwood’s trademark defensive pressure with her pace and agility at both ends of the ground. A real team lifter on the day. The one percenters were paramount by Perkins. Her hard chase and run-down tackle followed by an overhead mark and goal before half time really lifted the Hawks. Provided plenty of run down the wing, ran all day and created opportunities for her team and consistently troubled her opponent. A force on the half back line. She had 21 disposals and laid eight tackles for the Hawks. Kept her opponent scoreless and hardly with the ball. BOTH favourites suffered losses in a cracking first week of Victorian Football League (VFL) finals. Collingwood went down to the Hawks on Saturday, giving Hawthorn the first spot in the decider. Meanwhile, Geelong managed to knock out the high-scoring outfit, NT Thunder on Sunday, setting up a mouth-watering clash between the Pies and the Cats on Sunday. Led by captain Emma Mackie, Hawthorn capitalised on its double-chance by booking in a well-earned place in the VFLW Grand Final with a semi-final win over the Collingwood Magpies. The Hawks despatched Collingwood with their characteristic spread game and run and carry that could not be interfered with, despite the Pies’ best defensive pressure attempts on the day. Hawthorn leader, Meg Hutchins, who played 12 games for Collingwood across the 2017 and 2018 AFL Women’s seasons, was impressive with her pace and composure and showed her experience and leadership against her old side. The Hawks had 19 more handballs than the opposition, they stuck to their game plan, and created forward opportunities that converted on the scoreboard. Hawthorn applied consistent pressure, causing uncharacteristic turnovers and wasted opportunities in attack by the Magpies. Although it was an 11-point margin to the Hawks at half-time, the Pies had not found what would galvanise the group to lift and getting the job done looked out of their hands. The Hawks had team-lifters across the ground such as Sarah Perkins with her hard chase and run-down tackle followed by an overhead mark and goal. Rosie Dillon had 20 disposals and was dangerous at both ends. Lou Wotton was dominant with her ruck work, muscling out Eliza Hynes and winning in hitouts. The three goals by skipper, Emma Mackie, one being a long bomb from centre half forward to bounce through, proved the combination of these individual efforts was too lethal and most damaging in securing the upset victory. 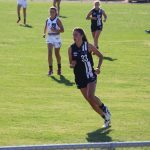 The Pies needed team-lifters and there was the usual class from Chloe Molloy early in the second quarter when she cleverly collected the ball and easily ran past a defender to kick straight and bounce a goal through. Molloy was solid in her role throughout but some real magic was on display in the last quarter when she kicked a 40-metre goal on the run that bounced through. The steady defensive work from Nicole Hildebrand and the high disposals and hard hitting from Sarah D’Arcy impacted the game, but these efforts did not ignite the Collingwood mindset to play their game, and they were unable to hold up the momentum of the Hawks. Both teams stepped up their physical presence on the day, but it was the Hawks who put it on the scoreboard and were unperturbed by the off-the-ball chat from the Pies. Sunday’s elimination final saw a thrilling contest from start to finish. The Thunder got the jump at the start, benefiting from a strong breeze as they dominated time in forward half. Despite the dominance, the Thunder were only able to register one goal on the scoreboard, squandering several opportunities en route to kicking five behinds. Geelong failed to take advantage of the wind in the second quarter as the Thunder extended their quarter time lead from nine points to 15 at the main break. As the wind died down in the third quarter, it was the Cats who took control of the game, kicking three goals to one and cutting the Thunder lead to just one point heading into the final term, setting up a grandstand finish. In the end it was Geelong who came out on top with a dominant fourth quarter to run out nine-point winners and book their place in the preliminary final against Collingwood next week. Richelle Cranston was spectacular all day long with two goals and 19 possessions as she willed her side to victory. 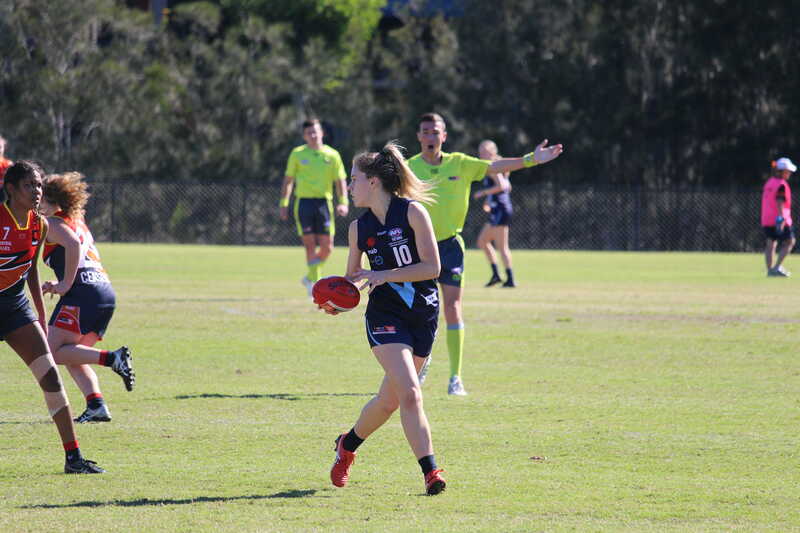 Fellow midfielder, Olivia Purcell also impressed, kicking one goal to go along with 19 possessions. For the Thunder, Marijana Rajcic was dangerous up forward kicking three goals, while captain, Angela Foley led from the front with a terrific game. The loss signals the end of the Thunder’s season, which had incredible promise. They’ll look to re-group and return even stronger in 2019. For Geelong, their victory gives them the opportunity to take on Collingwood in another do-or-die contest for a position in the Grand Final against Hawthorn in two weeks’ time. AS the home and away season begins to wind up, many teams are starting to settle their weekly changes. However, some vital changes are still being made going into Round 14, particularly in arguably the biggest clash of the weekend, when the two ladder-leaders, Collingwood and the NT Thunder go head to head. All in all, Round 14 is shaping up to be another exciting round for the Victorian Football League (VFL) Women’s Competition. Round 14 kicks off at Casey Fields with the Casey Demons taking on Melbourne University. Coming off a strong Round 13 performance, the Demons have kept changes to a minimum, bringing in three players. Former Vic Country skipper, Darcy Guttridge will be a welcome addition to the team alongside Jemma Turner and debutant, Amy Dunn. 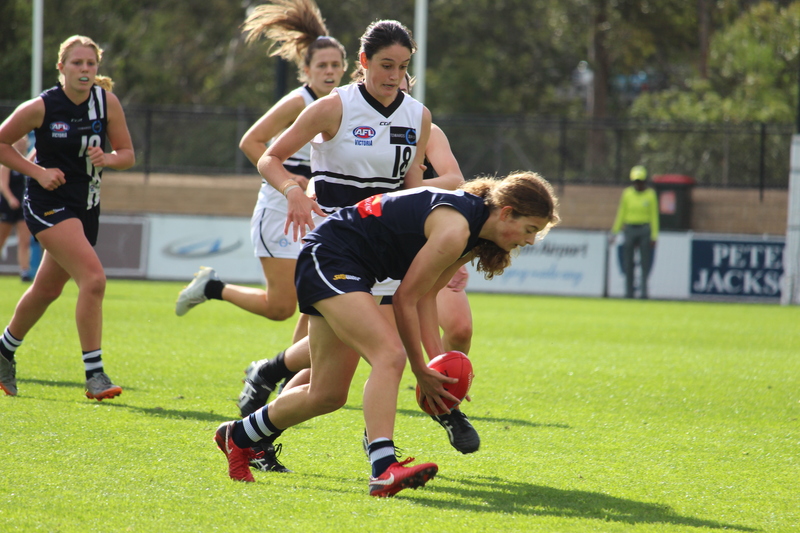 The Gippsland Power co-captain, who is currently balancing Year 12 and her football career, will be an exciting addition to the Demons’ side and comes in as the 23rd player this week. Gippsland teammate, Emily Haeusler and AFLW forward, Aliesha Newman have been named out. Returning from their Round 13 bye, the Mugars will be hoping to secure a few more wins before the season’s end. For the occasion, they have made six changes, swapping out star player, Emma Kearney for her 2019 North Melbourne AFLW teammates, Danielle Hardiman and Sophie Abbatangelo. Alexandra Saundry, Clara Fitzpatrick, Tasmanian Under 18s representative, Libby Haines and Vic Country Under-18 representative, Rebecca Webster have also been selected to play. Collingwood has made 10 team changes ahead of its important clash against the NT Thunder this week. With the home ground advantage on their side and top spot up for grabs, the Pies have made plenty of changes to suit. AFLW duo, Eliza Hynes and Nicole Hildebrand have been named to take to the field amongst many others. Grace Buchan, Katelyn Lee, Stacey Livingstone, Paige Nash, Shayla Marsh, Nicole Hales and Gippsland Power ruck, Jasmine Ferguson have also all been selected to play. Coming in as the 23rd player, Vic Metro midfielder, Katie Lynch has also been named, in what will be her debut performance. The Thunder, desperate to clinch top spot this week, has followed suit with Collingwood, making plenty of changes ahead of the big game. Classy goal kicker, Sue Nalder has been named back in the side this week alongside Ebony Marinoff, Kylie Duggan, Sharona Bishop and Gemma Cusack. 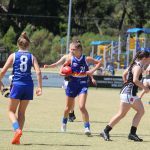 While the Thunder have been renowned for its numerous changes each week, they will now be looking to settle as finals approach, finalising this week’s team with the addition of Adelaide AFLW duo, Jenna McCormick and Justine Mules as well as Central Allies Under 18s representative, Madeline Gault. Backing up last week’s strong performance against Hawthorn, Darebin has only made one key change for Round 14. The Falcons have selected the prolific Stephanie Smith to take to the field and help them get across the line, while Vic Metro defender, Lauren Szigeti has been named out. The Southern Saints have also made very few changes this week, bringing in two players. Meghan McDonald and AFL Women’s Academy member, Courtney Jones have both been selected to play in place of Vic Metro representative, Gabriella De Angelis. Jones comes into the side fresh off a Herald Sun Shield Grand Final win so she could be a key player at Bill Lawry Oval. Geelong, who currently sits fourth on the ladder, will be in desperate need of a repeat performance of last week in Round 14. Ahead of the game, the Cats have made four changes, bringing in Laura Taylor and Isabel Currenti. Geelong has also selected two debutants for the match in Vic Country duo, Nina Morrison and Olivia Purcell. The pair impressed in this year’s TAC Cup Girls competition as part of the Geelong Falcons’ premiership team, and will look to continue to impress when they take to the field this weekend. Morrison in particular will be one to watch, as she was awarded the equal Most Valuable Player (MVP) in the recent AFL Women’s Under 18 Championships, so she will be a key addition against the Bombers. Essendon has kept changes to a minimum this week, bringing in three inclusions. Erin Bult, Carlee Portlock and Alex Quigley have all been named while Alexa Madden has been called to the sidelines. After a disappointing loss last week to the Geelong Cats, The Tigers will be looking to redeem themselves when they come up against Williamstown this weekend. They have named four inclusions for the match, headlined by AFLW talents, Christina Bernardi and Lauren Tesoriero, who should bring some stability and experience back to the side. Jenna Colwell and Ruby Edmeades have also been named in while Emma Gunn, Grace Egan and Gabrielle Deller will miss the clash. Williamstown has also made four changes to its Round 14 side. The Seagulls have fielded two debutants for the match in Melton Centrals junior, Rachael Jackson and Western Jet, Emily Gardner. The pair will be joined by Jasmine Garnerand Emily Paterno, who have also been named in. On the other hand, Rachel Achampong, Erin Meade, Jess Bartoloand Maddy James have come out of the squad. The Hawks will be glad to have their captain back this week after their narrow loss to Darebin last weekend. Emma Mackie has been selected to play alongside Dianna Haines, who make up only two inclusions this week as Hawthorn try to settle its line-up as finals approach. 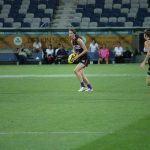 AFLW talents, Melissa Kuys and Pepa Randall have been named out. The Western Bulldogs have called upon assistant coach, Bree White to take to the field this week as part of a series of changes to their Round 14 side. Bailey Hunt, Kirsten McLeod, Amanda Tessari, Deanna Berry and Tiarna Ernst have all been named in this week as well as Western Bulldogs AFLW premiership player, Bonnie Toogood. Toogood will make her VFLW debut this week and is sure to be a key asset to the Dogs’ game play.